In the fall of 1956 square dancing was born in Washington County. A group of people, (enough to make a square) was invited to a church function where square dancing was introduced by a caller and dancers from Frederick. As an outcome of that exposure a huge beginner’s class was started and from this class two clubs were formed. The Hub City Promenaders and the Dixie Squarenaders and each of these clubs then had classes. By 1957 the clubs had gotten so big that we decided to form a new club, thus the Gad-Abouts came into existence. The club was named by Don & Ginny Dashnaw. As far as we know this was the only club that was not formed from a beginners class. Bill Dieterich and Bernice McKee are the only charter members, still dancing at the 55th anniversary. Both have since passed, however Curley and Ruthie Custer and Fred and Connie Bell were members at the start of the club and early in our existence. Danny Miller and George Sword joined. Our first roll book lists 43 couples and two associate couples from Harrisburg. In the beginning years we had nationally known guest callers for each dance, then in 1959 we hired out first time caller, Stan Miller from Washington, DC. Stan called until George Sword became our caller about 1965 and he called for us until 1997. In 1997 Art Lavigne became the club caller for the Gad-Abouts and remains with us to this day. In earlier years to become a member of the Gad-Abouts you had to be a proficient dancer. Submit an application and be approved by the Board members and voted in by the members. Attendance records were kept and excused absences were permitted but unexcused absences of more than three dances resulted in membership being cancelled and to rejoin the whole process had to be repeated. We first danced in various schools in the county then went to the old WACOHU Grange Hall which was located on Route 63 just North of Huyetts crossroads and in 1959 we moved to the current Grange Hall on Route 40 where we are still dancing. There were several years that we danced in the Union Hall in Maugsansville and Kauffman Station in Greencastle instead of at the Grange and we hold special dances at Quincy, Pa. The earliest record of dues was in 1959 and at that time they were $13.50 per couple per half. The Gad-Abouts also had a round dance club called the Round-Abouts and instructors/Demonstrators were Betty and Tom Johnson from NY City. They taught the steps and Demonstrated the Dance from then on you were on your own. You committed the dancers to memory or else because there was no cueing. The Round-Abouts was not restricted to Gad-About members and anyone could join. In 1997 Butch Bloxom became the regular cuer for the Gad-Abouts who initially had rounds at their first dance each month, then in 2009 started having round dancing at every dance. When we started there were only 39 calls compared to the over one hundred calls now, and there were hundreds of dancers and very few angels. 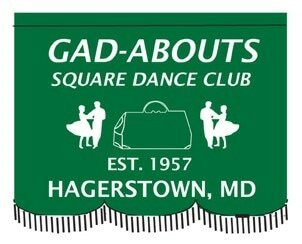 The Gad-Abouts badges were designed by Leroy Schoppert and Harold Schleigh. The Gad Abouts celebrated their 35th anniversary as a club in 1992 with National caller Tony Oxendine. Our 50th anniversary with Mike Sikorsky, our 55th with Hunter Keller and our 60th will be with Joe Saltel and Tom Miller on October 29, 2017.